Perfect Decrypt DVD, DVD Region Code Free and Css Free DVD Tools for you, so you can watch and copy any region code CSS-encrypted DVD movies on region-locked DVD drives ! 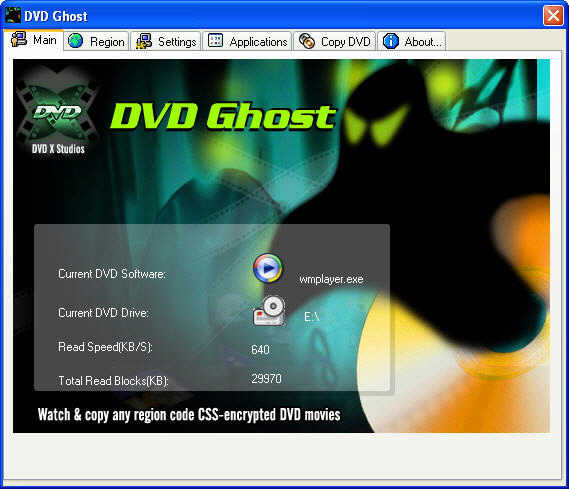 DVD Ghost is a very useful Decrypt DVD utility to make your DVD Copy / Play / Backup Software restriction-free, so you can Watch & Copy any region code CSS-encrypted DVD movies on region-locked DVD drives and it also supports backup / copy protected DVD to hard disk. DVD Ghost is a small, effective software working with DVD softwares. It is light on your system resources and resides in system tray. It removes all kinds of restrictions(CSS, RPC Region code, RCE, APS, UOPS, etc.) from the DVD discs in the background. Through DVD Ghost your player will be able to play all region DVD on all DVD drives with mismatched region code without changing the region code. You needn't hack DVD drive (flash firmware) which is very dangerous. DVD Ghost also allows you to copy protected DVD movie to hard disk if DVD copy / backup software not installed in your computer. Decrypt DVD Region code free / CSS free: Decrypts DVD Region code free / CSS free in the background. Macrovision-free: Removes APS protection from DVDs, this feature makes your DVD player VHS-friendly. RCE Region-free: Removes RCE region protection from DVDs dynamically. RPC-II / RPC-I Region-Free: It bypasses the RPC-II region protection of DVD drives, you can watch all-region DVDs on any DVD drives with a mismatched region code. You needn't change the region code any more. Operation-free: Removes UOPS(prohibited user operations) from DVDs. CSS-Free: Decrypts DVDs in the background. No harm to your DVD drives: It just bypasses the copyright protection of the DVD drives without changing any parameters or the firmware of the DVD drives. Supports DVD copy softwares: Intervideo DVDCopy, DVD Shrink . Supports Copy CSS-encrypted DVD movies to harddisk . Works well with all popular software DVD players: PowerDVD, WinDVD, MS Media Player, DirectDVD, etc. Xilisoft DVD Audio Ripper - DVD Audio Extractor to rip DVD audio. AVI to MPEG Converter - Perfect convert AVI to Mpeg 1 Mpeg 2.